ARLINGTON, WA - The giant horse caught his left foot on an exposed tree root and suddenly dropped to his knees in soft mud. 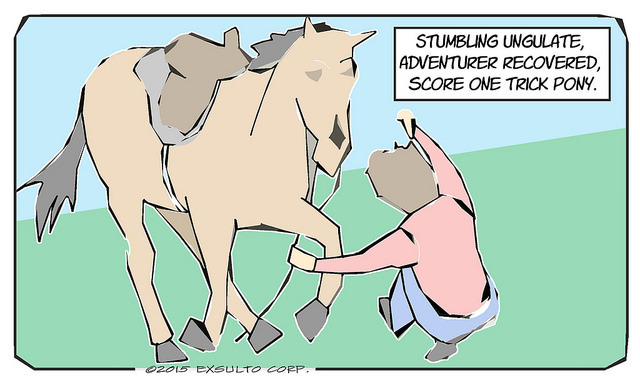 As his horse face dipped and kissed the trail, his rider was launched. My shoulder hit the ground and momentum rolled me back up onto my feet. Then six girls stopped, turned back, and saw a suspicious looking man standing next to a mud-bearded horse. They size the horse to the rider, and I learned that most of the available sizes were for little girls made of ultralight nylon and carbon fibre. Only the largest animal was rated for one-eighty. Earlier, while a half-dozen girls readied the horses, the owner had looked this one over very carefully - to gauge his mood. "You have experience? ", she asked.